Rochas has launched Mademoiselle Couture, a new 'sophisticated and sensual' flanker to 2017's Mademoiselle Rochas. Mademoiselle Couture is a woody floral, with notes of pear, pink pepper, bergamot, orange blossoms, lily of the valley, heliotrope, sandalwood, tonka bean and musk. 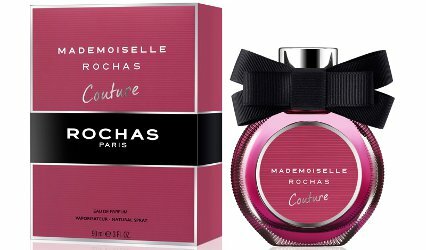 Rochas Mademoiselle Couture available in 30, 50 and 90 ml Eau de Parfum.